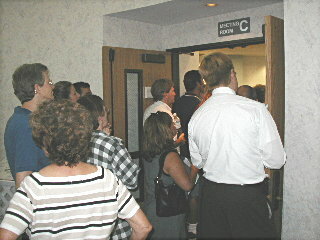 (August 1, 2003) -- Over 250 Huntington Beach residents filled their city's main library conference room beyond overflowing and fired pointed and sometimes angry questions at representatives of LB Airport, the FAA and JetBlue during a July 31 public meeting. The event, prompted by HB residents' complaints that incoming LB flights are too often too low, too loud and too numerous, drew a crowd beyond standing room only. People spilled out doorways. Some sat in the aisles. Others lined the walls. The meeting was conducted by LB Airport staff in coordination with HB City Hall. Airport Manager Chris Kunze delivered a power-point presentation on LB's noise budgeted flight slot ordinance and related issues. An FAA regional manager discussed air traffic issues. The audience responded...first with visible head-shaking, then audible snickers, then blunt written questions...and finally blazing questions and comments from the floor. Some official responses were met with disbelief...and occasionally scorn. We post a sound excerpt below. Mr. Kunze began by telling HB residents, "Our [LB] elected officials are very steadfastly in support of our existing rules [noise budgeted flight limits]. We're committed to operating an airport that maintains the highest possible environmental quality of life while providing economic benefits and air transportation vitality to the local area." Again, the airlines right now, based on the last twelve months are over the [noise] budget...If that continues there will be no additional flights over 41. If they change that by not flying late at night or by types of equipment, in theory they can earn additional flights...Our existing terminal was designed for 15 daily flights in terms of the parking structure, the terminal holdroom and baggage claim. We are going through an EIR process that's just now kicking off that will last close to one year. We'll b happy to keep you informed, and I think on our web site we'll have a lot of information if you want to participate in that. We want to design facilities to reasonably facilities roughly 3.8 million passengers [audible audience displeasure]. Right now we're at about 3 million passengers on an annualized basis. There is room for growth...the regional jets, the commuter flights we only have 3 of out of 25. We don't have parking right now...We are going to be looking at enhancements to provide reasonable accommodation to the flight activity level permitted by 41 flights, but no more. So if the airlines were to earn more, we won't really have the capacity, it'll be a little uncomfortable. Well no, not at all. Again, the city adopted a Strategic Plan about two years ago and in that it says to maximize use at the airport in terms of economic return but only within the existing rules. And again, right now our Councilmembers -- all nine of them and our Mayor -- are steadfastly in support of that. So it's something I know Long Beach residents are going to be monitoring. I don't see anything in the future. We are totally surrounded by homes at the Airport. For those of you that know the area, there's no way to fly in and out without flying over very nice homes. It's been the most political issue since the early '60s, the advent of the jet age. That's not going to go away. The people who live in Long Beach, and you obviously as well, are obviously very attentive to the quality of life so from my perspective that's not going to change, but the citizenry has to monitor that. What about growth visible at the airport, or plans to add another runway? Definitely no plans to add any more runways. I'm not sure what growth [you mean] is going on at the Airport right now. We have a lot of modular buildings and tents just to accommodate the traffic...Other than [new required security arrangements] and what we're doing in terms of the EIR to accommodate the 3.8 million passengers, no other plans for development of the Airport. Mr. Kunze indicated an "economic impact report" on the Airport is being prepared (to replace a report proffered in the early 1990s) and the new report "should be available within probably six to nine months." One resident, frustrated at officialdom's seeming defense of the status quo, rose to his feet and charged, "It's not OK and you're going to have to change it! Because it's not OK! The number of houses they've sold...since 1989, so you can make a very nice power point presentation, but this is all B.S...[applause]." Another shouted, "Build an airport at El Toro!" Mr. Kunze then introduced Chuck Hicks, Jr., Esq., FAA Western-Pacific Region Manager, Technical Standards Branch. Mr. Hicks began by offering a quip, "I'm here from the government and I'm here to help you"...which produced polite laughter...until he began describing the area's air traffic control system. He quickly encountered even more heated questions and angry comments than Mr. Kunze. "They're coming in too low!" shouted one audience member. Others shouted similar views. Several cited dates and times. Still others asked why flights couldn't make an incoming turn northwest of Huntington Beach over the Seal Beach Naval Weapons Station. Mr. Hicks indicated flights paths were determined based on safety and control purposes and followed certain elevation standards on approach. He said the FAA monitors flights...and wants to hear from residents reporting particularly low approaches. That offer (which meant the public would have to do more work) annoyed some in the crowd. One resident told the FAA official that the number of complaints evident in the room showed residents could not all be wrong. Mr. Hicks said flight routes were developed in conjunction with the Southern California Association of Governments (SCAG). "The whole purpose of the Southern California Association of Governments is to work with the FAA and to identify ways of improving and reducing the impact of aircraft activities around the L.A. basin. That is a mechanism that's there that can be used by you to help identify issues. Again understand, please,...we have two million aircraft a year...operating in the L.A. basin. Any change that we make to one segment to one approach in this basin has a domino effect on everything else in this basin," Mr. Hicks said. One resident asked about pollution. "As far as the FAA, we ensure that the operation meets the requirements of the [federal] Environmental Protection Agency and we agreed to say they meet the environmental requirements of California. As far as a Prop 65 requirement [state law requiring disclosure warnings by pollution emitters], I don't know anything about Prop 65. As far as what the airplanes, what the exhausts are, the exhausts that you would see [are] typically in a diesel," Mr. Hicks said. 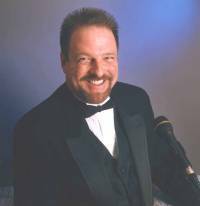 JetBlue Captain Charlie Andrews also ran into verbal turbulence. Capt. Andrews (attending with JetBlue's Western Region Gov't & Community Affairs Mgr. Kristy Aridizzone who did not speak) recently helped devise a quieter LB Airport take off protocol which gained FAA approval. He was initially jeered before being able to explain intricacies like vectors, glide paths and the like. Capt. Andrews indicated he was personally receptive to considering changes provided they make safety and aviation sense...but stressed that changes in approach paths require FAA approval. Some residents took in details; others left. One Huntington Beach resident stood outside the room with a clip board, collecting names and email addresses for a grassroots group on LB Airport issues he said he'll be forming independent of Huntington Beach City Hall. Huntington Beach Councilmember/Mayor Pro Tem Cathy Green and Councilmembers Dave Sullivan and Gil Coerper attended the meeting. Councilman Coerper said, "I think we need more meetings. I think we have to be a little more organized on this here...We need to get together bigger facilities, have it constructed so that each person can come up and talk and get their message across." The meeting permitted questions written on cards read by the moderator, Airport Public Information Officer Sharon Diggs-Jackson, with some extemporaneous questions taken from the floor. Airport Manager Kunze indicated he would field questions after the meeting...and did. Airport PIO Diggs-Jackson made an effort to ensure questions -- including pointed ones -- were taken and heard. However, one person who did not have the chance to be heard was LB's best known activist on airport issues, Ms. Rae Gabelich, president of LBHUSH2. 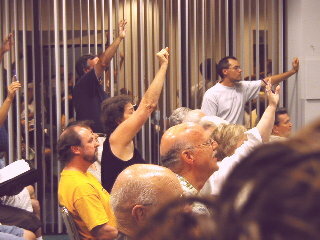 Ms. Gabelich had her hand raised through several portions of the meeting but was not called on. Near the end of the meeting, Ms. Diggs-Jackson acknowledged Ms. Gabelich's presence and indicated that because the meeting was for HB residents, with an overflow crowd and time constraints, HB residents (and not Ms. Gabelich) would be heard. 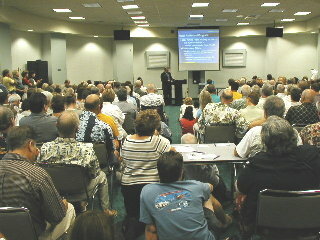 The July 31 HB library event follows an April 2003 appearance at the HB City Council by LB Airport Manager Kunze...during which (as reported by LBReport.com) he was questioned by HB Councilmembers supporting their constituents' complaints over increased LB Airport commercial flights. 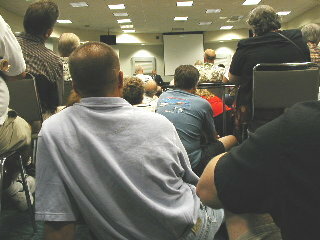 In August 2002, Costa Mesa's City Council received public comment (during a period for non-agendized items) objecting to the increased number of overflights headed to LB Airport. Huntington Beach is represented by Congressman Dana Rohrabacher...whose district also includes part of ELB and airport-impacted Los Altos, as well as OC coastal areas from Costa Mesa through HB up to Palos Verdes.